©2012 John M. Gottman (P)2012 Brilliance Audio, Inc. I rate this book high because I appreciate hearing the research methods behind the research. However, if you're not wanting to understand the methods that in depth I suggest Gottman's book What Makes Love Last. If you can appreciate the mathematics read this before that book. You'll better understand the research he refers to in that book. Good book, a lot of math, stats so be prepared. Every married man should read this book. This book and the 7 principles book have been vital tools in my efforts to save my marriage from my emotional distance and neglect. I recommend it to all men and women who want a committed relationship, period. Like having tables of data read out loud? What would have made The Science of Trust better? It would have helped significantly if the narrator had at least ATTEMPTED to differentiate the voices when reading transcripts of conversations between husbands and wives. Instead, he just keeps reading in his regular voice which is confusing AND annoying. The poor editing job of the written text did not help matters at ALL. This information would have been better presented if it was more concisely presented. It could be cut by at least 25%. I may avoid Gottman's work in audio format after this... I admire his work as an academic, and wanted to learn more after he was mentioned in Gladwell's books, but clearly I need to be able to visually scan through to get to useful bits. What didn’t you like about J. Charles’s performance? I didn't LIKE anything about J. Charles's performance. Lacking in differentiation between "speakers", and my text-to-speech software on my Android has about as much inflection. Disappointment in how crappy an editing job was done. Paragraphs are repeated in several places and the flow of the text is bad. Where the heck were the copy editors in this??? Gottman is doing important work into human relationships. Please don't let the poor quality of this specific publication keep you from looking into what he's been doing. I've read most of Gottmans books and love him but when I started reading this one I thought it was so boring. It started slow and went deep into game theory. Half way through though it became my favorite book by him with detailed descriptions of his research and finding and in my option his best published work. This book was so helpful! While the information included was very detailed and thorough, it was a difficult book to listen to because it was very academic and scientific in nature. There was some application, but it got lost amongst the definitions and figures. As long as you go in with the right expectations, you'll be OK, but if, like me, you were expecting more of a how-to in easy to understand layman's terms, you're better off looking elsewhere. The linking of science and research to issues of trust and marriage adds legitimacy. This book is more like a college textbook. My only complaint is the use of multiple variables with similar terminology got confusing, especially because there was no easy way to recheck meanings. Unlike a textbook, there was no easy way to find definitions or to use a chart/graph to help you follow along. Great application of math theory to marriage. Would you listen to The Science of Trust again? Why? Probably not again because it is 16 hours long. What was one of the most memorable moments of The Science of Trust? The Zeigarnik Effect. Understanding this alone may save your marriage. Which character – as performed by J. Charles – was your favorite? While this book was written for practitioners, I found it great and a lay person. In various classes in theory and practice of the many subtypes of therapy, couple's therapy made me throw my hands up in frustration. Every professor had their own techniques and usually vague or unstated foundations that looked to me more like choices of assumptions than a theory. This grew sharp when every professor in this type of therapy taught things contradictory with the others. Their results were dismal, with rational explanations for why. 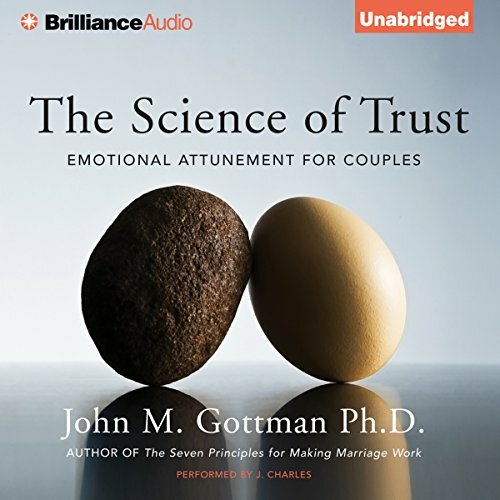 Then I read Gottman's 'The Science of Trust' plus listened to this audiobook multiple times each and from the first reading, my view of couple's therapy changed. He has developed an extensively tested model of couple dynamics that apply across age groups, straight/gay, cultural and 40 years of data collection. It works; it makes clear predictions which so far have stood the test of time. It is nothing short of amazing. What to know why your relationship is having problems? What to know how to make it better? Read this book. If you have a stronger math background, you can follow this with his, Mathematics of Marriage, obviously only in print and maybe e-book from Amazon. The sampler seemed like it was going to be great. If you can manage to get through the statics and vast background studies I am sure there’s some really good help to be had but I just found it very irritating and wanted to just get to the point.